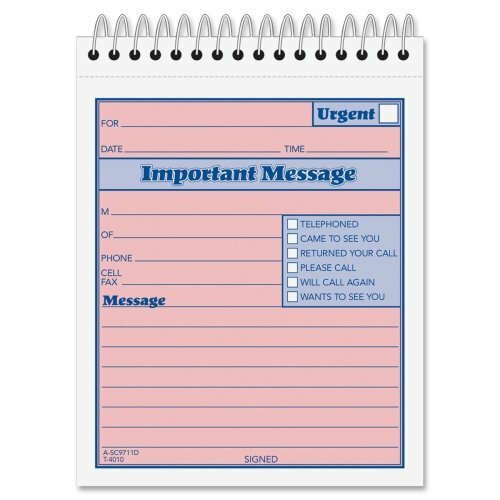 Wholesale CASE of 25 - Adams Phone Message Booklet-While You Were Out Phone Message Book, 50 Sets, 4"x5-1/2"
Spiral-bound message booklet offers an easy way to record and save important messages. Carbonless format creates a second copy for a permanent record with a white original and canary copy. Booklet is spiral-bound at the top for right-handed or left-handed writing. Easy checkoff boxes identify urgent messages or follow-up required. If you have any questions about this product by ABF, contact us by completing and submitting the form below. If you are looking for a specif part number, please include it with your message.